Silver Linings Playbook Blu-ray Review The organic quality of the performances lifts the already affecting screenplay to a level of skewed genius that transcends even Russell’s best work. Director David O. Russell’s (Three Kings, The Fighter) latest offering, the seven Oscar nominated Silver Linings Playbook, is structurally a generic romantic comedy but simmering beneath the clichés of first kisses coming complete with a circling camera and a third act dance competition that *Gasp* may decide the fate of this unconventional couple lies a curiously close to the bone examination of the tribulations of living with a diagnosed mental illness. That distinction is important, because although the film deals overtly with Pat Solitano Jr.’s (Bradley Cooper) diagnosis with Bi-Polar Disorder, it also becomes obvious that Pat’s father, Pat Sr. (Robert DeNiro) has multiple idiosyncrasies that point towards a severe case of O.C.D. This becomes most apparent when one sees that Pat Sr. treats his son more as a good luck charm for gambling on football games than as his own offspring; Pat Sr. believes that his team’s victory hinges on stringent adherence to certain esoteric rituals, most important of which is the presence of Pat Jr. during the game. The family brushes off these rituals as little more than eccentricities whilst conversely treating Pat Jr. differently now that his diagnosis, and the stigma attached to it, is known, showing the dichotomy between perceptions once something is labelled. Silver Linings Playbook is a refreshingly honest look at mental illness, deftly sidestepping the po-faced seriousness normally afforded to the subject by offering an oftentimes amusing character study where the respective illnesses of the main characters are incidental to the richness of the characters themselves. Sufferers of mental illness aren’t defined by that one – admittedly sometimes large - aspect of their personality, and Russell recognises this as a director, refusing to dwell and offer up a tear jerker about a person’s lifelong battle with the detrimental effects of an illness and instead serving up a love story where mental illness just happens to be one factor amongst a myriad of stumbling first steps down the road to love. This kind of restraint when handling such easily misunderstood subject matter is a rare thing and most surely comes from Russell’s own experiences with his son’s battle against mental illness. The film starts with former schoolteacher Pat Jr. leaving the psychiatric institution he has spent the last eight months in with a new perspective and outlook on life. He has one major goal in his life – To reconcile with his former partner Nikki. The fact that the violent physical outburst that landed him in the hospital was triggered by her infidelity doesn’t seem to factor in; Pat equates the acquisition of Nikki with personal contentment. Forced to live under the watchful eye of his parents (Jacki Weaver and Robert DeNiro) and attend regular therapy sessions, Pat struggles to assimilate back into society, especially with his diagnosis and the baggage that comes with it dangling over his head. When he meets Tiffany (Jennifer Lawrence in her Oscar winning performance), who has emotional issues of her own due to the recent death of her partner, he’s at first bemused, then intrigued by her bluntness and seeming comfort with what others may perceive as character flaws. Promising to assist Pat with his attempts to win back Nikki, the film focuses on the budding friendship between the two leads before moving into the contrived but still charmingly quirky third act where financial and emotion success relies on scoring five or above in a dance contest; Pat Sr., after suffering a big loss on a game, agrees to an unorthodox double-or-nothing bet reliant on both his team winning the following game and the aforementioned dance results. This is where the film admittedly takes a few faltering steps in a saccharine direction, but it’s all so delightfully handled you’re more than willing to forgive these minor quibbles. Silver Linings Playbook has an immaculate 1080p transfer with no obvious banding or blocking. The colours are realistic and fine detail is resplendent in high definition; the audio comes in a lossless DTS-HD Master Audio 5.1 mix that performs admirably for the most part. There’s clear channel delineation and no evidence of audible bleed through. The dynamic range and fidelity is of the quality expected from a Roadshow release. 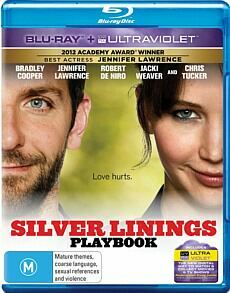 The Blu ray release of Silver Linings Playbook has over an hour and a half of special features; from insightful looks behind the scenes and snippets from an in-depth Q&A, they’re all of exceptional quality. Special mention must go to the deleted scenes – One gets the feeling they were mostly excised for time alone, as they’re indistinguishable in quality from the film proper. The organic quality of the performances lifts the already affecting screenplay to a level of skewed genius that transcends even Russell’s best work. Lawrence in particular shines and is well deserving of her gold statuette – Even if I personally think she was robbed in 2010 for her performance in Winter’s Bone - and although there are some moments where one has to suspend disbelief regarding certain plot elements (The therapist’s subplot, for instance) for the most part Silver Linings Playbook is an accomplished look at love and all the craziness that comes with it.. Literally, in this case.